Herbal extracts, also called tinctures, are one of the best ways to include herbal remedies in your emergency preparedness preps. Tinctures are concentrated and have a long shelf life- much longer than dried herbs or capsules. Like other preparations, though, extracts will need to be protected from extreme temperatures and direct sunlight, otherwise they will degrade and become less potent. Most herbal tinctures are made using alcohol. Everclear, vodka, and brandy are the most popular choices. Rubbing alcohol should never be used for a tincture that you plan to use internally. It’s toxic! A ratio of 50/50 alcohol and water will make the strongest, longest lasting extracts, so 100 proof vodka is often a good choice for preppers concerned about shelf life. Vodka is also easier to obtain than Everclear, and there’s no need to worry about adjusting the proof. There are two ways to make a tincture. The first way is an easy, general guide that’s safe for most plants and useful if there is no convenient way to measure out exact amounts. We’ll look at that method here, because it’s great for beginners. There’s no tricky math to figure out ratios or trying to deal with grams of dry weight vs fluid ounces of the alcohol. This method is the traditional, or “folk” method of making tinctures, and is what I use the majority of the time. For this method, place dried or fresh herbs into a glass canning jar and add brandy or vodka to cover the herbs by one inch. Place the lid on the jar, and leave it in a cool, dark place for two weeks so that the herbs can fully extract into the alcohol. During the two weeks, check on the tincture once a day. Add more alcohol if needed, as the herbs may absorb some of it over time, and shake the jar gently each time you check on it. After two weeks, use a mesh sieve or small colander lined with muslin or cheesecloth to strain the extract into a clean jar. The herbs left over from the tincture are called the marc. Twist the top of the cloth together to form a small bundle with the marc inside, and press as much liquid out of the marc as you can for your tincture. The mostly-dry marc can be added to a compost pile, if you like. It’s best to keep your finished tinctures in blue or amber glass to help reduce exposure to light. Opaque screw top nalgene plastic bottles can be used as well for a more durable option. Be sure to label your extracts clearly with the name of the herb, alcohol used, and the date it was pressed. Herbal tinctures kept in a cool environment and out of direct sunlight can be expected to last anywhere from three to five years, or even longer. Signs of spoilage to look for include mold (most likely to happen in a tincture made from fresh herbs, because they have a higher water content which dilutes the alcohol), a change in consistency, or changes in color. Tinctures will evaporate over time, so be sure to use a tight fitting lid and store the jars standing upright in a position where they are less likely to leak. One other quirk of homemade tinctures to be aware of is the tendency for the extract to form a layer of sediment in the bottom of the jar. To lessen this, the tincture can be dripped through a few layers of coffee filters to clear it from the dust-sized particles of herbs that the cheesecloth didn’t trap earlier. It’s always a good idea to store glass dropper lids separately and seal your homemade tinctures with a regular screw cap. The same sediment that can form in the bottom of the jar can also clog up a dropper pipette and be difficult to clean out. Making your own herbal tinctures is a very cost effective way to add to your herbal preps, and a very good preparedness skill to have. 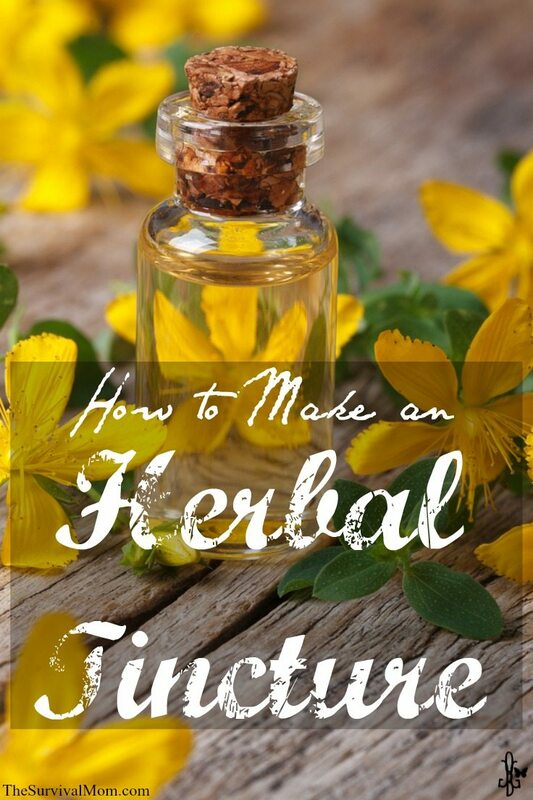 Most importantly, though, you need to learn how to safely use the herbal tinctures you make. Be sure to research each herb individually so that you understand potential safety issues, drug interactions, and the traditional dosages of each herb. Most herbs will have a range of between 15 and 30 drops per serving. If an herb is traditionally used in smaller or even single drop doses, it should be used by experienced herbalists only and should not be made using the “folk” method- more precise measurements are required for low-dose herbs. Very nice article. I’ve wanting to do vanilla extract just like this, although I may not strain it. Just for an example, what herbs are typically used? All I can think of is parsley and basil. Not the right choice… Lol. But what then? Nettles, achillea, willow bark? I’m glad you enjoyed the article. 🙂 Nettles, yarrow, and willow are perfect examples. A trip to your local health food store should yield plenty of other ideas. Good luck! Hi Rusty, I’m the herbalist that wrote the article above for Lisa. You shouldn’t need to wait more than two weeks before your tincture is ready, but some people do like to leave them for a month or longer. Everclear is overkill if you are using dried herbs, but the higher alcohol content is a good idea if you are using fresh herbs. They have a higher water content and the tincture is less likely to spoil with the higher amount of alcohol. A jigger of any herb is a bad idea, there are definitely some that will poison you at that amount. Elderberry will most likely only give you the runs (it’s a mild laxative), but if you wish to avoid that potential I would stick to drops. Eyedroppers work well, or a quarter teaspoon measuring spoon is equivalent to 30 drops. Good luck to you, Rusty! I’m glad you’re trying something new! you wrote that “a ratio of 50/50 alcohol and water will make the strongest, longest lasting extracts”, when do you add the water? I want to make Astragalus tincture to supplement my family during tick season, should I use fresh or dry Astragalus? Do you have any other particular suggestion?